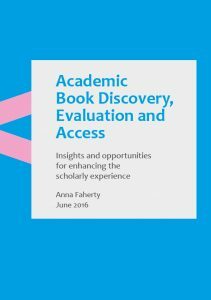 The Academic Book Discovery, Evaluation and Access report, written by Anna Faherty (http://www.strategiccontent.co.uk/), summarises learnings from a small-scale exploratory study investigating how humanities academics encounter, evaluate, and gain access to print and ebooks related to their research and teaching. 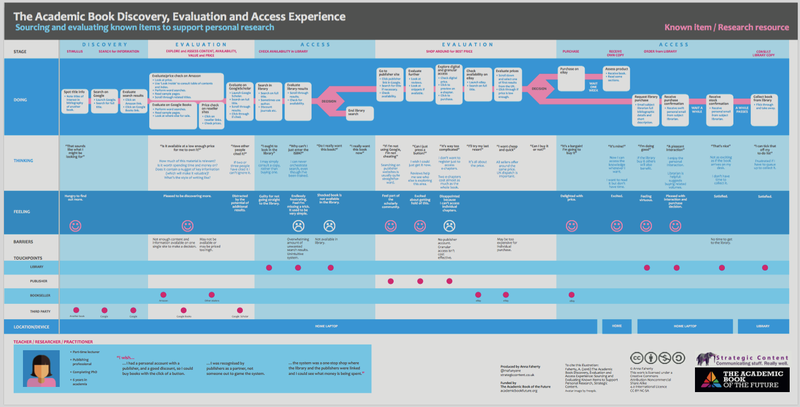 The study seeks to understand the holistic user experience, mapping user journeys to identify aspects of book discovery and access that might be improved. The implications for academic libraries, publishers and booksellers are considered, as potential improvements to current systems are mooted along with opportunities for more disruptive innovation. The study draws on data collected from dedicated interviews with academics and the wider publishing, information studies and researcher-experience literature. Its approach is heavily influenced by design methodologies, as the reality of academic practice is captured through visual tools and possible new academic experiences are generated through divergent thinking. The results are shared as a series of insights and practical design questions intended to prompt innovative thinking across the academic publishing, bookselling and library sectors. Overall, this report serves two purposes: it is a research paper exploring the experience of academics as they seek out, assess and access book content and the first stage of a collaborative design project to enhance that experience. The report was researched and produced by Anna Faherty and was funded by The Academic Book of the Future project. The initiative also prompted the development of a new resource for lecturers, students and professionals, designed to help them discover books relating to publishing: Books About Publishing. These are open access materials distributed under the terms of the Creative Commons Attribution Noncommercial Share Alike Licence: CC-BY-NC-SA. Anna Faherty has worked in the academic publishing sector for over two decades and in academia for the past six years. Anna held editorial positions within Hachette, Pearson, Cengage, and Palgrave Macmillan before working with Oxford University Press, Taylor & Francis, SAGE and Wiley on freelance projects. Anna has taught on publishing programmes at Kingston University and Oxford Brookes University and is an Honorary Lecturer at University College London. She has developed bespoke training courses for a number of academic publishers and her online learning courses for professionals are part of an award-winning continuing professional development training suite. Her research paper on novelty-centred business models in publishing won the International Journal of the Book 2014 International Award for Excellence. Anna runs Strategic Content and tweets as @mafunyane.